FAQ: 60 Second Salad Maker - Healthy, fresh salads made easy! Are there duties and taxes on international shipments? 60 Second salad is shipped from the USA. We will pay the duties and taxes for shipments going to the countries below. If your country is not listed, it means that we're unfortunately not able to pre-pay duties/taxes, and they may be accessed to the recipient at the time of delivery. How much salad does it make? 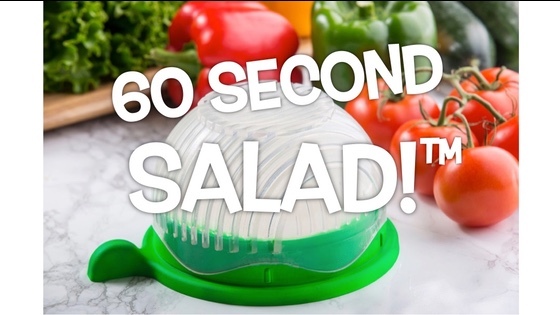 60 Second Salad Maker makes a nice size personal salad. It holds 2.5 - 3 cups of chopped salad. Will the BPA-free plastic eventually make the knife get dull? 60 Second Salad will have the same effect on a knife as an ordinary plastic cutting board. Good news! Your 60 Second Salad makers will be arriving at our fulfillment center on Tuesday the 28th and will be promptly shipped to you! We’ve had a lot of great feedback on our Kickstarter comment page (link below) about the quality and functionality of the product and can’t wait to get yours in your hands! Currently, there are 403 people that have had payment processing issues and will need to update their credit card information by Sunday night so we can ship your order in our first batch! If you’re having trouble updating your information please contact BackerKit support at support@backerkit.com and they will be able assist you. If you have moved since placing your pre-order, please update your shipping address right away so you 60 Second Salad doesn’t end up in someone else’s hands! Link to kickstarter comments: https://www.kickstarter.com/projects/930441187/60-second-salad-maker-healthy-fresh-salads-made-ea/comments Thanks for your support and enjoy! Are there duties and taxes on international shipments? How much salad does it make? Will the BPA-free plastic eventually make the knife get dull? When is Shipping slated to begin? (subject to change) I want to know when my reward is shipping. I am having trouble filling out my survey. I would like to make a change to my pledge. I would like help with preorders. I have a issue with my pledge finances. I have a question for the project creator. I have a question not listed here. I want a refund for my initial campaign pledge. I have a question about BackerKit.